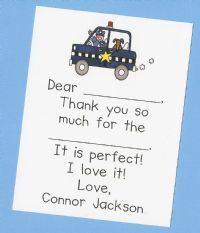 Fill in the blank notes are perfect for the little ones writing thank you notes for their special gifts. Also great for teachers. Notes are personalized with the name of your choice at the bottom. Sold in a set of 12 notes and envelopes. You can get a mixture of all four colors or select from the colors shown. Please enter personalization info here. Color Choices: orange, yellow, light pink, hot pink, red, dark blue, turquoise, light purple, dark purple, lime, green, brown or black. 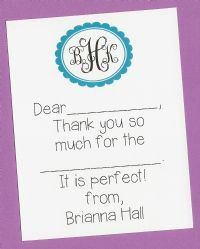 Enter color choice, name and monogram in personalization box below.